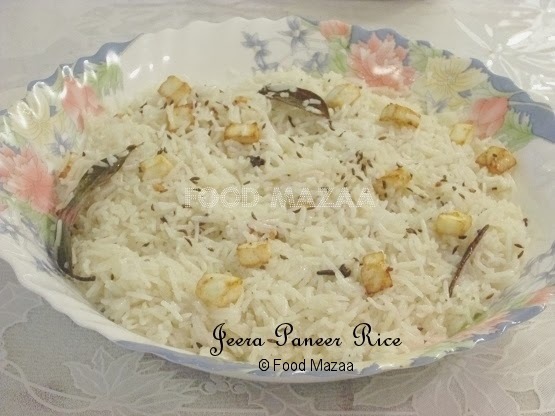 This is a simple preparation of rice with paneer, flavoured with jeera and whole spices. It tastes really good with all the Shahi side dishes. This is a perfect party dish. Oil / ghee .. 1 tbsp or as needed. 1. Wash the rice and soak for 1 hour. 2. Fry the paneer pieces to a light golden colour. Set aside. 3. In a pan heat oil or ghee and add the whole spices except cumin / caraway seeds. 4. When they give out an aroma add the rice and saute. Add 2 cups water. 5. Season with salt and cook until 3/4 th done. 7. Heat a little ghee. Sprinkle the cumin / caraway seeds on the rice and pour hot ghee over them. 8. Keep on dum for a minute. Wow , simple yet tatsty rice. Thanks for sending to my event . Simple and flavorful rice.. Looks inviting! Awesome jeera paneer rice..my favourite at any time. Thats a wonderful jeera paneer rice. Happy to follow u. If u get time visit my space too. I like the addition of Paneer to jeera rice. I can happily have this flavourful rice with a rich gravy. Flavorful pulao, liked the addition of paneer..
Hello, I tried this paneer recipe and it tastes just awesome. I also recommend everyone to try this at least one time you will love this. Thanks for sharing such amazing paneer recipe.